Limited displacements of machines during seismic stimulations. 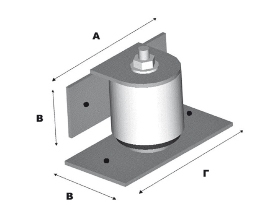 Restrain machines which are based on antivibration mounts during excitation of external forces. Machines based on antivibration mounts such as springs, elastic pads etc., during external stimulations (e.g. earthquake, wind, twister etc.) can develop critical displacements. These displacements may stop the operation or even cause serious damage to the machine. Seismic restraints could resist the imposed forces and limit the movement of equipment to all three directions. Besides, restraints prevent sound – bridge between the machine and its support base, due to their internal neoprene bushings. Thus the vibrations during the operation are not transmitted. Four SeismiCon pieces should be installed, one on every side of the machine, near the corners of its base. The application of the restraint must be done after the installation and the operation of the machine. Afterwards, restraint can be regulated in height. Metal sheet additions could be screwed or welded on the restraint’s parts, if it is necessary to be adapted with special needs of installation. It must be ensured that the machine frame and also the building structure have the necessary strength to remain both attached to the SeismiCon, during an earthquake or extreme wind loading. The following images show applications of SeismiCon.